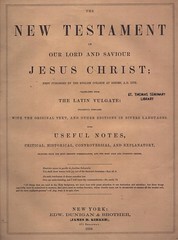 Title The / New Testament / of / Our Lord and Saviour / Jesus Christ; / First Published by the English College at Rheims, A. D. 1582. / Translated from / the Latin Vulgate: / Diligently Compared / with the Original Text, and Other Editions in Divers Languages. / with / Useful Notes, / Critical, Historical, Controversial, and Explanatory, / Selected from the Most Eminent Commentators, and the Most Able and Judicious Critics. / New York: / Edward Dunigan & Brother, / (James B. Kirker), / 371 Broadway. / 1859. 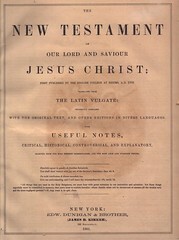 Title The / New Testament / of / Our Lord and Saviour / Jesus Christ; / First Published by the English College at Rheims, A. D. 1582. / Translated from / the Latin Vulgate: / Diligently Compared / with the Original Text, and Other Editions in Divers Languages. / with / Useful Notes, / Critical, Historical, Controversial, and Explanatory, / Selected from the Most Eminent Commentators, and the Most Able and Judicious Critics. / New York: / Edward Dunigan & Brother, / (James B. Kirker), / 599 Broadway. / 1861.